I have studied this painting and decided to add some glazes of color to certain areas. 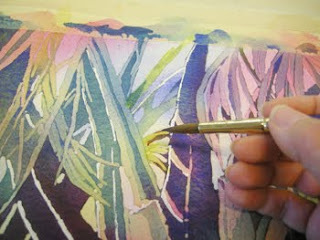 I used New Gamboge, very wet, to glaze some of the palm fronds that needed to be warmed up. I used Pthalo Blue and Winsor Blue to glaze some areas that needed to be cooled and/or darkened in value. I have to step back often so that I don't overwork the piece. Sometimes I turn it upside down and step back to look at it. This gives me a fresh perspective and I can judge color, value and shapes much more objectively. Once these final touch-ups are complete I can remove the painting from the board, sign it, and get it matted and framed! I very much enjoyed your palm tree done wet in wet.